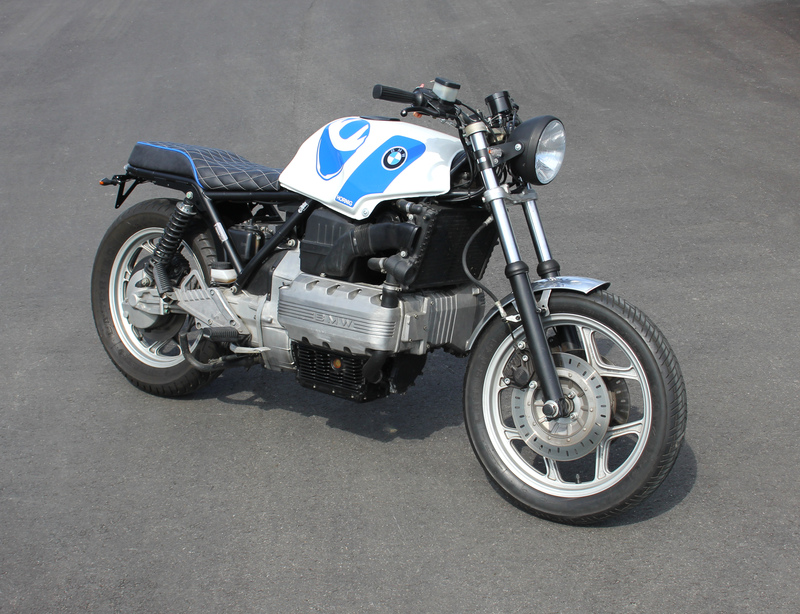 After our successful retro design conversions of some different older BMW models (R1100R, R1100GS, R45), we were looking for a new challenge this year: a conversion of a BMW K100RS (model year 1986, ca. 36.000km, 1.900,- €). 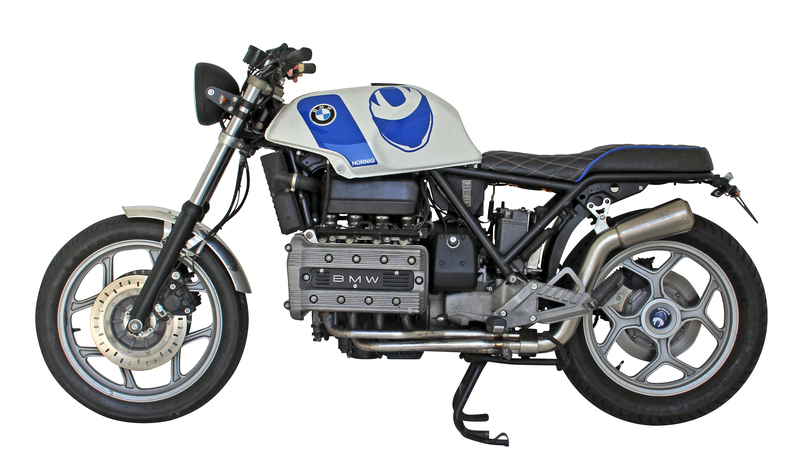 The aim of the conversion was to give a new fresh retro-look to the quite old motorcycle by removing all "unnecessary" parts and nevertheless getting the TÜV approval. First, we removed the complete front fairing including the mirrors and the headlight. Instead of the original headlight we installed a round headlight (Louis, article 10034274, 64,95 €) by means of the suitable headlight mounting (Louis, article 10020912, 24,99 €). On the left and on the right side of the headlight mounting we installed mini LED indicators (White Lights, article WLB-181-L, 34,90 €). Because of the dismantling of the complete front fairing including the instrumental panel we needed a new speedometer, which was as small as possible and would still be able to display the most important things. So we mounted the small, round tachometer from Louis (article 10036500, 149,99 €) with integrated display for all indications. As a replacement for the original speedometer unit we installed a replacement circuit board (see https://www.mikrocontroller.net/topic/382331 , ca. 250,- €). This was important, because otherwise the neutral indicator and the charging of the battery, for example, would not have worked anymore. 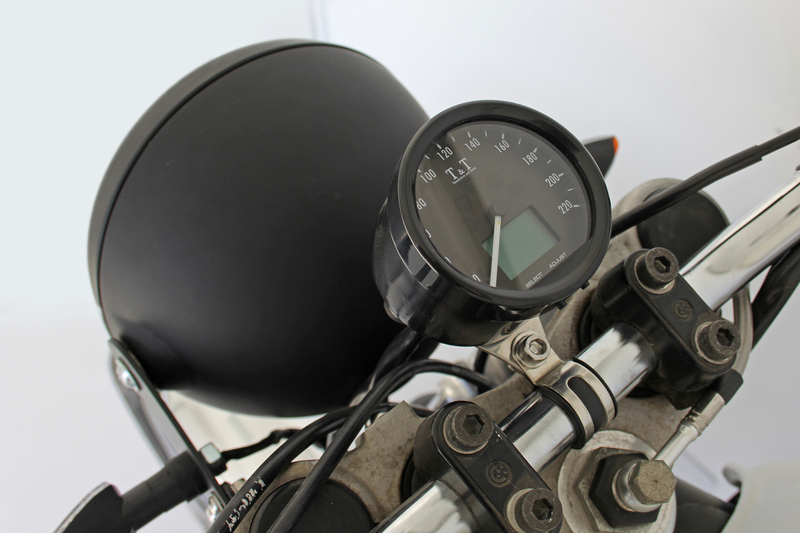 Due to the removal of the original plastic instruments on the handlebar we also had to relocate the ignition lock. 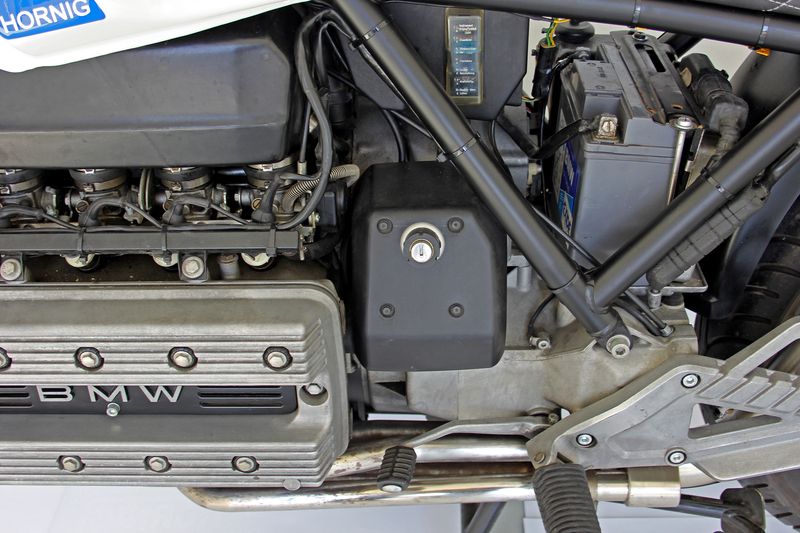 We decided to install it on the left side of the motorcycle, behind the engine block. The control unit was also relocated. Now, it is not placed on the battery anymore, but behind the battery. 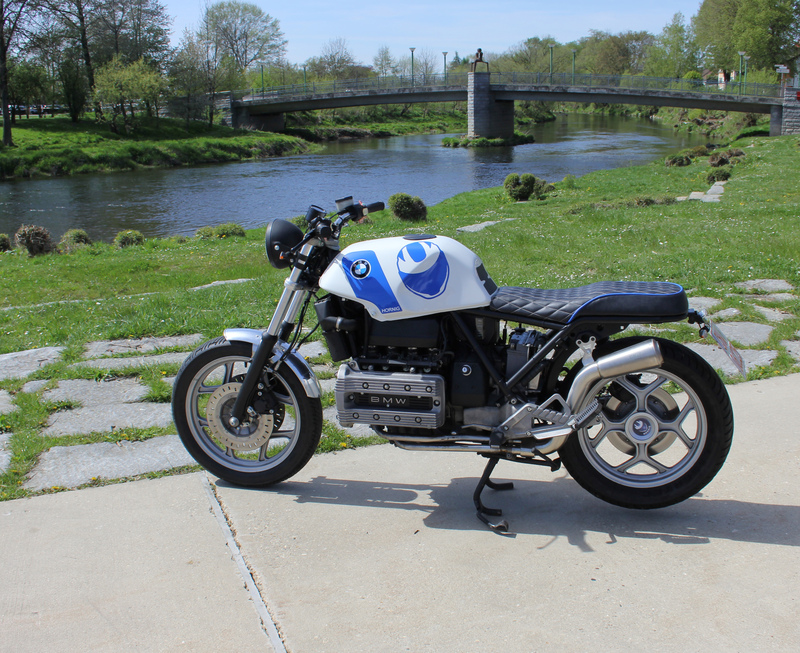 In addition to that, our BMW K100RS got a new handlebar (LSL, article 123LN01CR/22, 79,- €) and a front mudguard made of aluminum (LSL, article 506A05017, 79,95 €), which was mounted by means of suitable stainless steel fixing brackets (LSL, article 506HTB014, 49,95 €). Due to the new handlebar we needed longer brake lines. Therefore, we had some high-quality braided steel brake lines produced specially for our K100RS Café Racer (Spiegler, length 200mm, ca. 40.- €). 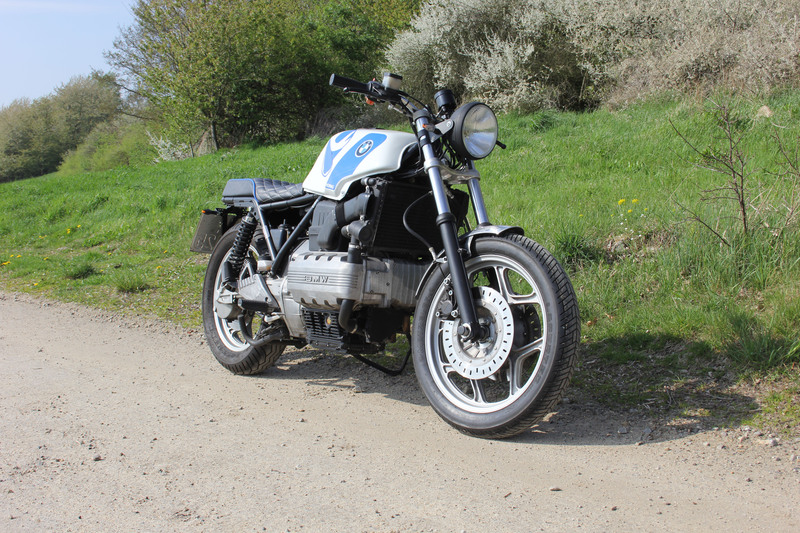 At the rear of the motorcycle we also dismantled the fairing with the rear light, the indicators, the case mounting and the mudguard. Then the rear section was shortened, adjusted and the frame was painted black. 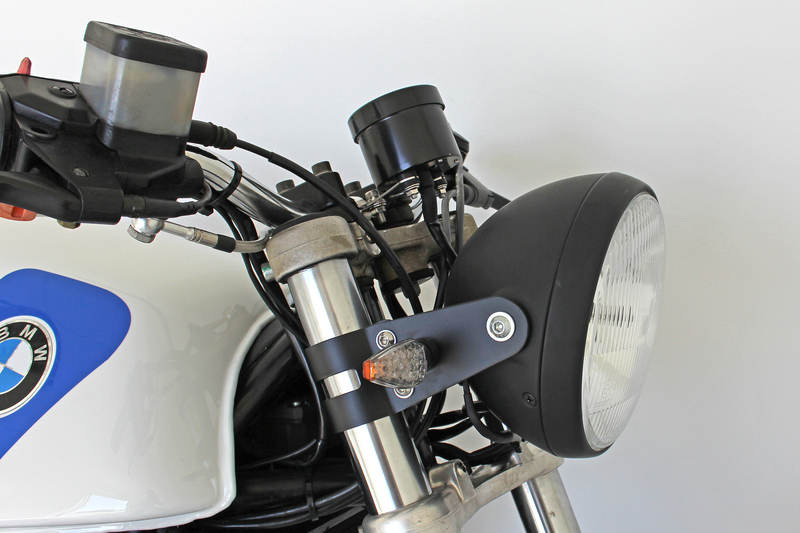 We welded a new license plate holder (White Lights, article 390365, 58,- €) to the rear frame and mounted our mini LED rearlight (Motorcycle Parts Hornig, article WLL-999-L, 29,90 €) and the mini LED indicators (White Lights, article WLB-181-L, 34,90 €) to the license plate holder. To keep the right blinking frequency we installed proper resistors (Kellermann, article 123.952, 4,95 € each) on the rear frame. 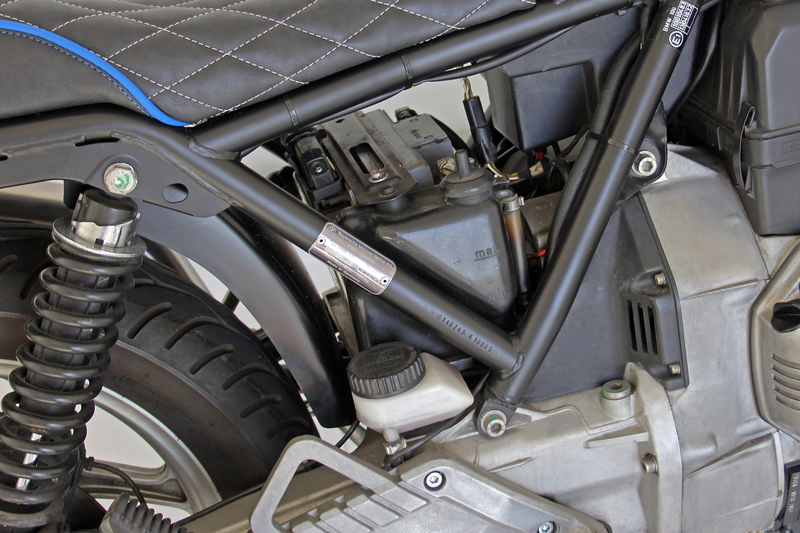 Our Café Racer also got a new rear hugger made of aluminum (LSL, article 507A060B18, 119,95 €), which we shortened before we mounted it to our K100RS. 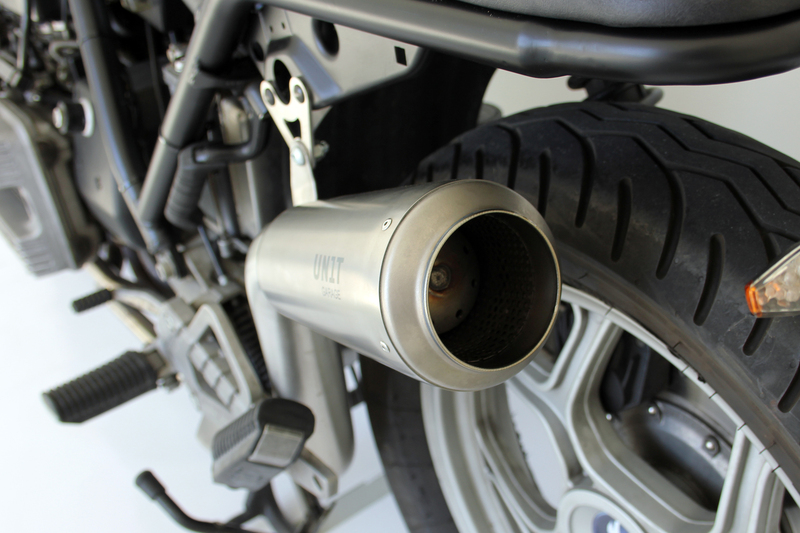 In addition to that, our motorcycle got a new nosed up exhaust (Unit Garage, article 1807_100, 498,- €). 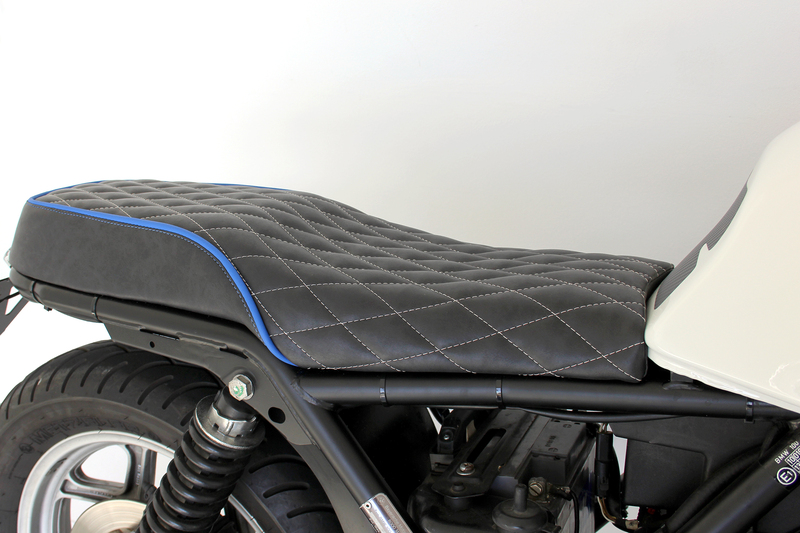 For the shortened rear section we produced a completely new double seat bench in black with blue highlights on it (ca. 400,- €). Then we smoothed/filled the where the original seat formerly touched it and painted the whole tank white. 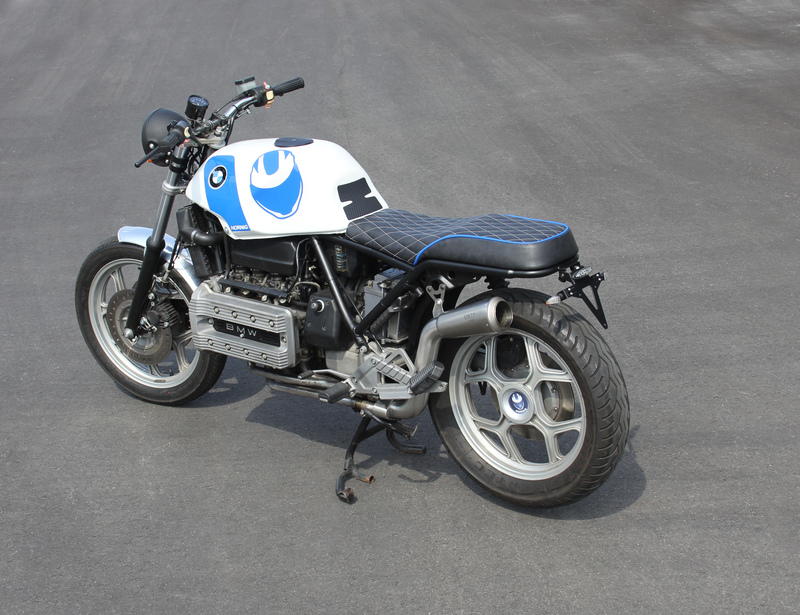 For an optical highlight we fixed some blue foil parts on the sides of the tank. 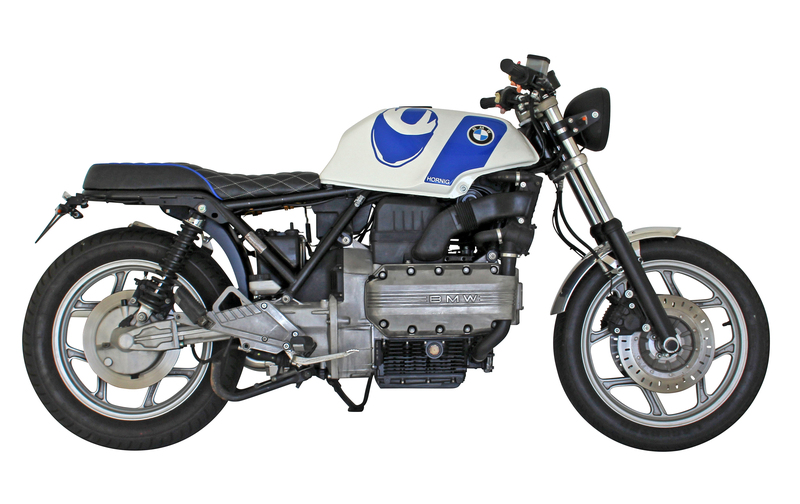 Moreover, we also equipped the tank with our Hornig logo colored in the same shade of blue (whole tank design ca. 300,- €). The tank design is completed by our self-made tank pad with carbon look (ca. 12,- €). 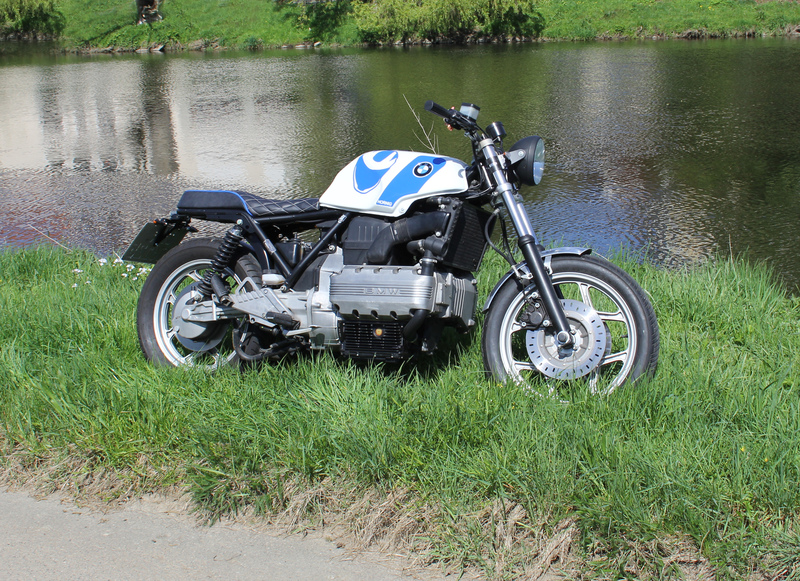 To get the TÜV- approval we finally mounted proper mirrors (Motorcycle Parts Hornig, 2x article 5116529, 32,90 € each) on the handlebar. 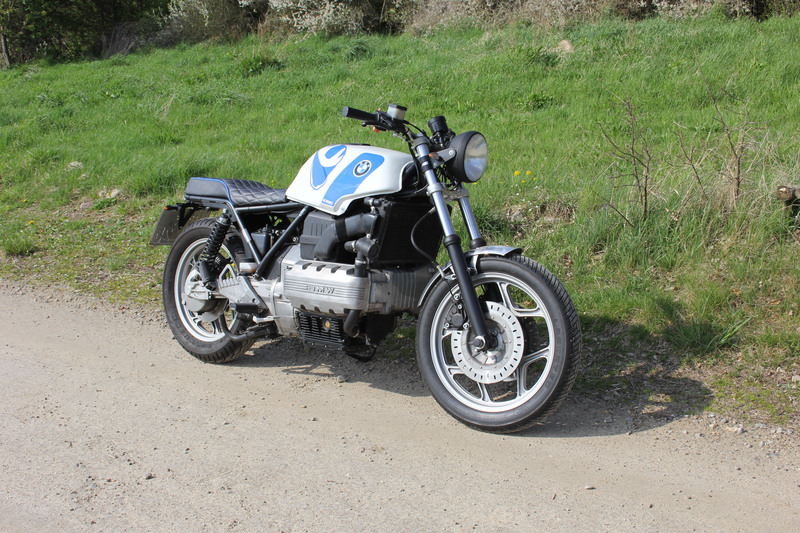 Our BMW K100RS Café Racer conversion is another unique vehicle as well as lots of the parts that we mounted onto it. Some parts were newly or further developed in order to meet our requirements. The conversion is intended to be used as a template or inspiration. We would be pleased about a reproduction or a development. 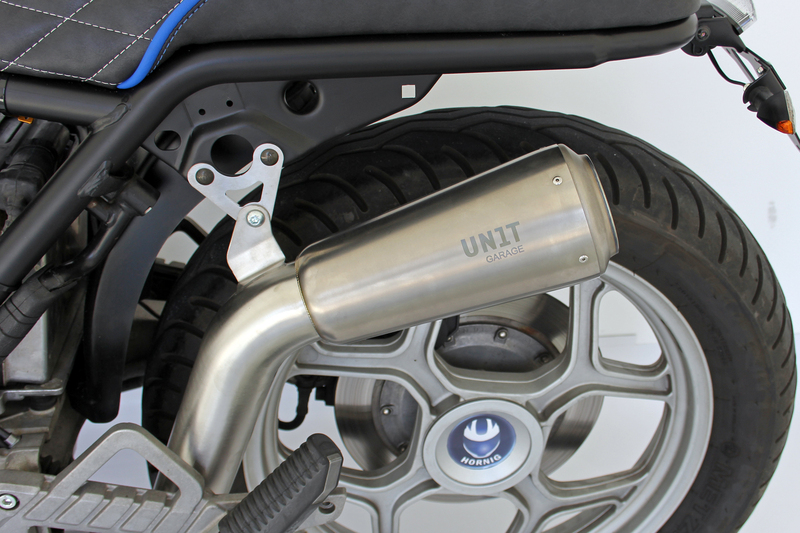 We cannot guarantee that you will receive an approval from all Technical Inspection Agencies (in Germany: TÜV, Dekra or GÜT) with this conversion. The experiences which we made with our other conversions are reflected here. 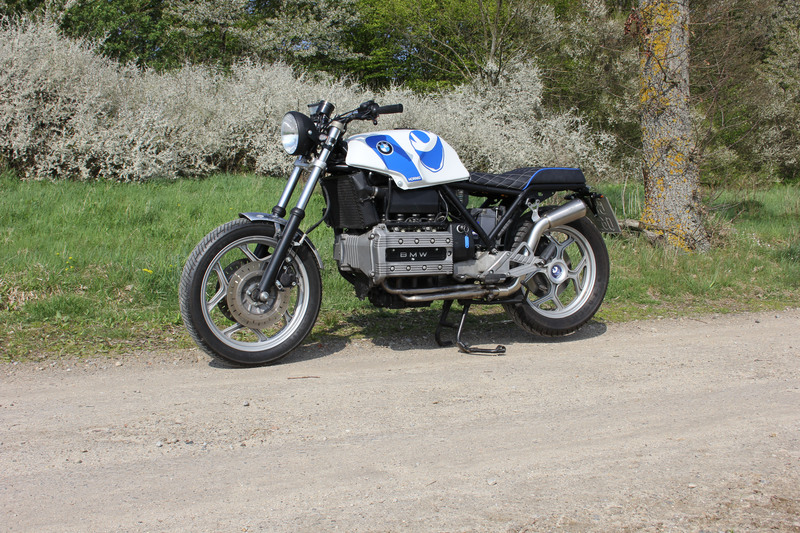 Prior to the start of the rebuilding we contacted the TÜV in Cham, Germany again to clarify whether we had to pay attention at something special at our BMW K100RS conversion. The total conversion amounted to approximately 4.200,- EUR and was realized in about 50 hours. However, the sometimes difficult research and organization work and the procurement of the parts are not included in the calculation. All mentioned prices and article numbers without obligation and subject to change.